Venue: Pyrenees, Spain (Catalonia). Staying in village Ager. Low airtime pilots can expect an intro to mountain flying. Small bungalows based at the landing field. Own bedroom. Each bungalow shares a bathroom & kitchen. Non flyer friendly Very friendly for non flyers. Lots of activities to do. 1st to 14th September 2019 HG pilots only!!! Hugely successful for the last 10 years. We have flown in this area with pilots usually flying at least 6 days of 7 during each of our stays, generally only losing 2 or 3 days in the month, not to mention many personal best flights for the staff too. We're back in Ager again in August and September (the best time of year to fly this site) for yet more XC with tapas. Adventure, warmth, sunshine and pure cross country spirit! Keep the 2019 flying season alive: head to the southern side of the Pyrenees for the best flying this August and September. World-class flying: Ager, our base for the week, and host to both the British Open in 2006 & 2014 and the Paragliding World Cup in 2007; and as a potential day trip, the famous site of Castejon de Sos which has hosted countless World cup and international paragliding competitions over the years. (Note, Castejon is dependent on weather). 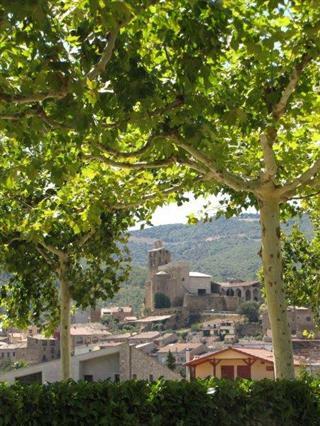 Our base is the peaceful Catalonian town of Ager. Set in the “foothills” (still mountains by British standards!!) of the Pyrenees, Ager is basked in warm and reliable flying air throughout the autumn. With great X-C potential and famed for its evening restitution, this trip will keep the summer of 2019 alive and healthy. The Catalonian corner of the pre-Pyrenees boasts some of the best X-C flying on the planet. As northern Europe starts to succumb to stable air (or even cold and grey! ), late August and September, is the perfect time of year to visit this beautiful corner of Europe. The Ager flying Arena The main Ager flying arena was carefully constructed millions of year ago ostensibly with paragliders in mind. Orientated east-west, the main valley provides us with many safe landing options. The main Montsec mountain range is South-facing with four main easily accessible launch sites, providing perfect flying opportunities for all pilot levels throughout the day. Although a Mountain flying venue, the large valleys also work very well and offer a flat-land flying element to this destination. The main Ager landing area is perfect. Not only is it the biggest landing area I’ve ever seen it also happens to be right next to the bar, the pool and our accommodation, offering immediate solutions for the all important “après-vol” experience. The main Mountain chain is some 40km long and separated into upper and lower tiers. Two of the mains launch sites, “Coll d’Ares” and “ la Pedra” are located on the upper tier with the other two, namely “Raudoral”, and “Gabrielo” situated on the lower second tier. This gives us some obvious flying advantages. Upper launches (the launch we tend to use most often) are separated from the landing zone by 900m (3,000ft+) of height difference. This unusual topography means that if you miss lift on the first level you get a second chance to hook a thermal on the second tier. The two tier mountain also means that if the top gets too strong to launch we have some very favorable launch options lower down the mountain. Thermic: The first thermals of the day start to trickle up the mountain at about 10:30am. Shortly thereafter it is possible to stay up and fly the spectacular scenery all day long. Later in the day thermals can get quite strong (up to 4m/s) but are usually not “head-banging”. Later still, the air starts to calm and the ridges become soarable. Then in the evening, the famous restitution bubbles up from the valley floor rendering the Ager skies flyable well through to sunset and beyond. Typically, at this time of day the whole valley goes “magic” with smooth gentle lift to be found all over the place: restitution - a special experience for any pilot. This flying paradise is relatively undiscovered so we expect to have the skies to ourselves. What level of pilots should I be? assess and understand the dangers of take-off and landing areas. perform an unassisted forward launch in light conditions. perform an unassisted reverse launch in strong winds. take full responsibility for their pre-flight preparations. take full responsibility for deciding whether or not conditions are suitable for them. take full responsibility for all take-off, landing and in-flight decisions. Pilots with lower experience levels might decide not to fly during the middle of the day, (when not only can it be quite strong, but also hot!) instead opting to make full use of the free private swimming pool. The flyable day usually goes on right until sunset (and beyond!) so even if you opt to avoid the stronger stuff, you’ll still be able to clock-up the hours and get pretty much as much flying as you want. Whether you’re a sky-god, or a pilot looking to catch your first thermal; or maybe you simply want to get some airtime in a magnificent flying arena, we’re confident that this trip has all the ingredients of a truly excellent paragliding adventure. In 2006, the British Open Competition was held here in Ager. 6 days out of 7 were flyable with achievable tasks of up to 90km - some of the biggest competition tasks in British Open history! Pilots commented that several days were definitely 100km days! Cloud-base is often at 3000m or more and pilots can fly in almost any direction. All flight planning, radio guidance and retrieves are part of the deal. Great X-C adventures are right here waiting! Accommodation is in neat wooden bungalows located ri ght next to the main landing area. Although the bungalows are 4 person bungalows, we know you want to be comfortable so we're placing a maximum of 2 pilots each! That way you get a bedroom each, with a bathroom, mini kitchen and lounge area to share. In addition we have free use of the swimming pool located just two minutes walk away. Even closer to hand are wireless internet facilities, cafe, restaurant and bar. We have the ideal paragliding hangout for your holiday. Guiding comes in many forms, from the simple (“There’s the take-off. Hope to see you later!”), through to the superior air-to-air radio assisted guiding. Whilst we believe there is room for most types of guiding, opts to give you the highest quality service. This year we are once again teaming up with Toby Colombe of Passion Paragliding. Together we have considerably more experience of this area than other operators. We aim to give you the very best service and flying experience with your safety as our absolute priority. We'll have an excellent staff to pilot ratio with at least two guides and two retrieve drivers!! In addition to daily weather briefings and full site briefings, we will also be offering task-focussed flight plans to suit every ability level. To help keep you in the air as long as possible (if that’s what you want!) we will also be flying with you to give you in air tips and pointers to maximize your flying experience. We believe that it is very important that your guide flies with you - to help you understand the air and get the most from your flight. This is your holiday. Get the most out of it: ask as many flying-related questions as you like. We are here to help. Last year we had pilots flying X-C twice a day and then going up for some glass off restitution at the end of the day! You can also expect a full "TOMTOM"-assisted retrieval service however far you fly. Although based at Ager, to add some spice and variety to our trip and also to be sure of finding the best weather, we will sometimes be spending two days (and one night) at Castejon. We are flexible to go there when conditions are best! This excellent XC venue regularly holds competition events: not only does it boast a large grassy take-off and huge landing area it’s also offers some excellent XC opportunities right in the heart of the Pyrenean Mountains. If we opt to overnight in Castejon (a holiday within a holiday) we tend to stay in a local hotel (charge of about 25euros per person). Should we suffer un-flyable weather we will help organise alternative activities. As we all know, paragliding is a weather-dependent sport, so if we can’t fly safely, we’ll help you arrange alternative activities, for example, climbing, swimming, walking, mountain-biking, paint-balling, cave exploring and other tourist activities. Meals, insurance and flights are not included. In Ager we eat out in local restaurants where a full 3 course meal with wine usually costs only about 11-16euros. Happy days! Many years we also offer a specialised Pilot training course in Ager. T his will be open to all CP qualified pilots with at least 25 hours airtime. You will learn advanced flying techniques, cover all the theory and have the opportunity to complete all Pilot Tasks as required by the BHPA. You will sit the Pilot Exam at the end of the week and finish the week with a new “Pilot” Rating. This week is an excellent chance for Club Pilots to get plenty of airtime, catch a lot of sunshine, dramatically improve their flying knowledge and go home with a qualification to be proud of. Best of all, we are NOT charging a penny extra. Book early as places are limited. We are operating free airport pick-up from Barcelona airport for flights arriving by 2:30pm at the latest. Also included is our airport drop-off on the morning at the end of the week. (Thursday pick up and drop off) Return flights should leave after 12noon. There are a multitude of cheap flight operators flying from airports all over the UK. The following links might help you find the best flight for you. IMPORTANT NOTICE: Please make sure you book flights for Barcelona (NOT Girona or Reus) and that they are arriving in time for your FREE transfer to Ager. Please wait until your trip with us has been confirmed before booking your flights. On recent trips, the majority of clients have booked their flights with Easyjet or British Airways, whom offer flexible times and airport departure options. Ryanair has also featured in recent years as well as several other operators you could explore.